I consider this dish a personal victory over two of my produce nemeses: mustard greens and lentil sprouts. I know that both of these vegetables are perfectly lovely and nutritious, but they gave me fits before I finally tamed them in this dish. Mustard greens and lentil sprouts are not inherently tricky to cook, I just didn’t grow up eating them and I didn’t have a clue about what do with them when I first got them in the Local Box. Wash mustard greens really well before and after chopping to get rid of any grit. We use a salad spinner. Use recipes with bold flavors, like curries, to complement the strong flavor of the mustard greens. Chop the leaves in fine pieces before cooking them. Plan to cook mustard greens about twice as long as you would a milder winter green like spinach. This knocks out any toughness, even in the stems, and improves the final texture of the greens. For lentil sprouts, I don’t have any preparation tips since most recipes call for the whole lentils in salad. Just wash ’em and go! 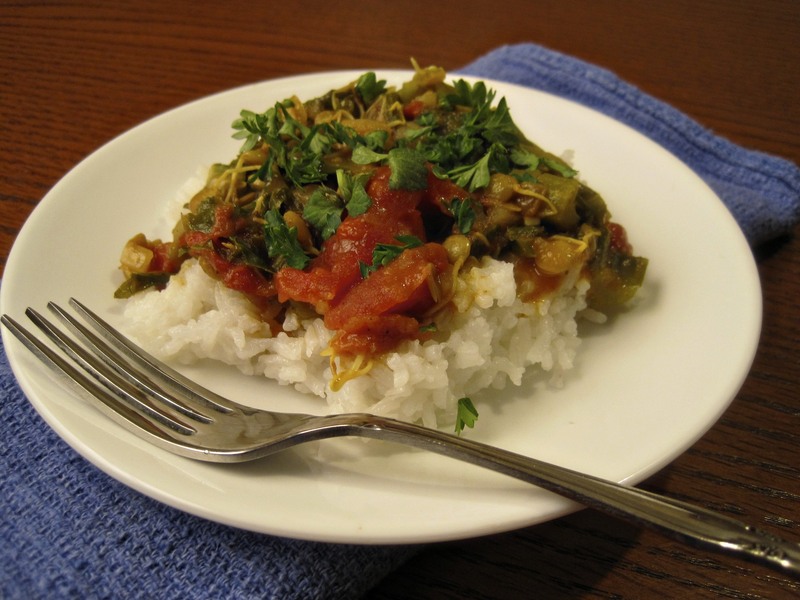 I like sprout salads okay but my favorite way to eat lentil sprouts is to sneak them into spicy stews like this curry. They become very tender as they cook and fade into the background texture of the dish. This particular curry came about after I experimented with several different recipes from around the internet: Jugalbandi’s Sprout Curry, Allrecipes’ Curried Mustard Greens, and Matthew Card’s Chickpea Dal. The final dish is a hybrid of all these, and it comes together in just about half an hour in the kitchen. I originally planned to add a full can of chickpeas to this recipe and decided against it when I ran out of room in my pot. However, they would have been a welcome addition (along with some extra liquid) if I had needed to stretch the recipe for an unexpected dinner guest. In a large, lidded skillet, heat olive oil over medium heat. Add chopped onions, minced garlic and diced jalapeno and cook, stirring occasionally, until onions are translucent, about 5 minutes. 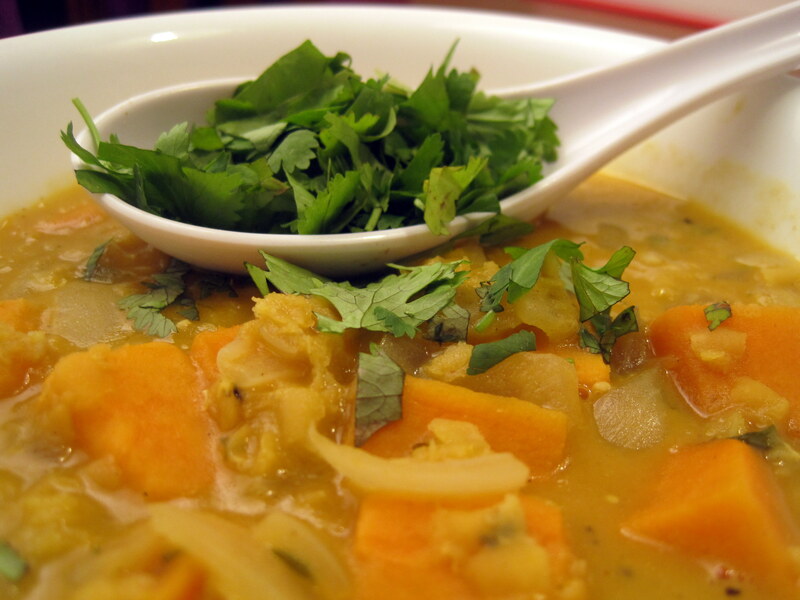 Add remaining ingredients to the pot, except coconut milk and garnishes. Stirring constantly, cook until liquid comes to a boil. Reduce heat to medium low, cover and simmer for 15 minutes. At the end of cooking, stir in coconut milk. 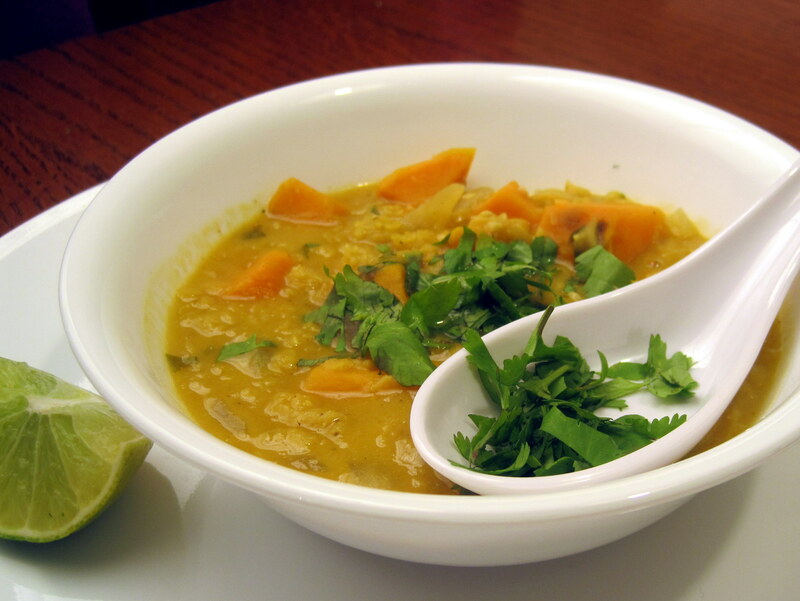 Garnish curry with fresh cilantro or parsley and serve with rice, naan, or pita. If you’ve seen the Greenling newsletter this week, you know that we’re celebrating a great season of greens! Winter is prime time in Texas for kale, spinach, curly mustard, collards, arugula, bok choy, and lots of other leafy vegetables. These nutritional powerhouses are fun to cook with and easy to include in meals, either as main dishes or as sides. 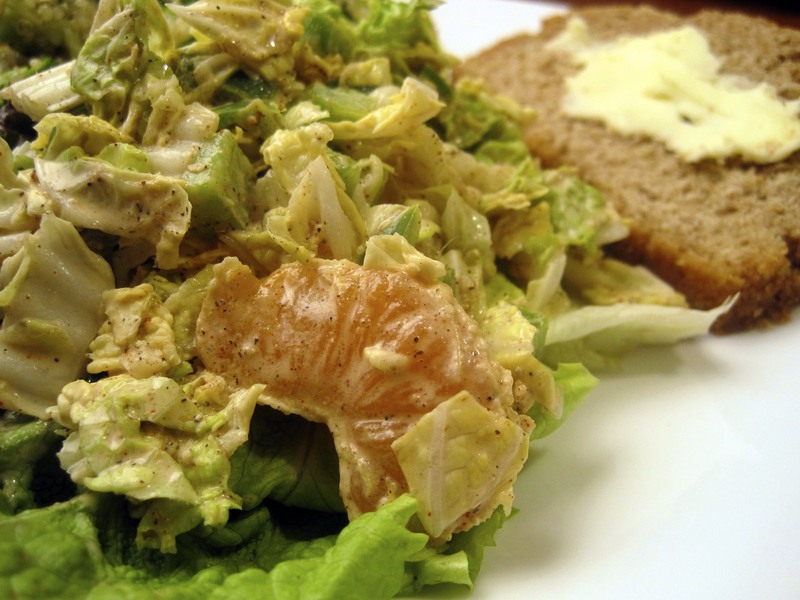 Of course, a great way to enjoy greens is on their own, either as a side dish or an entrée. 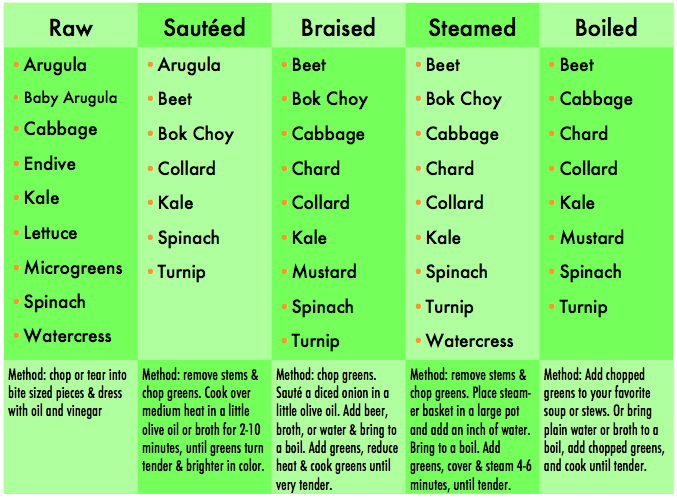 The chart above can also help you to include greens in some familiar recipes. 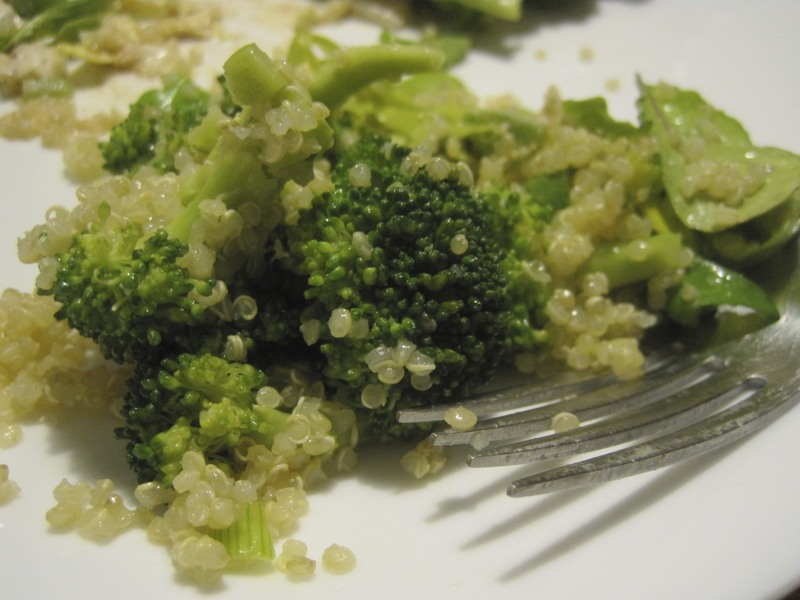 Simply match the cooking style of your existing recipe to one of the greens you have on hand. For example, if you’re making scrambled eggs, any of the greens in the “sauté” column will make a great addition. Just sauté a 1/2 cup of finely chopped greens in a skillet, then add two eggs and cook them as usual. Add any greens from the “boil” column to comforting dishes like this chicken noodleor tortilla soup for a painless extra serving of veggies with lunch or dinner. Same goes for the greens in the braised column. During the last 10-20 minutes of cooking, throw in a few cups of chopped beet greens, chard, kale or spinach to your favorite braised bratwurst, tofu, or chicken recipes, and you’ve got an instant, one-dish meal. The biggest secret to cooking with greens is to use the freshest ones you can. Fresh greens from a local farm are more nutritious and taste better than greens that have flown across the country before sitting on a grocery store shelf all week. It’s also important to choose organic greens, since conventionally grown greens like spinach, lettuce and kale carry high levels of pesticide residue, even after washing. 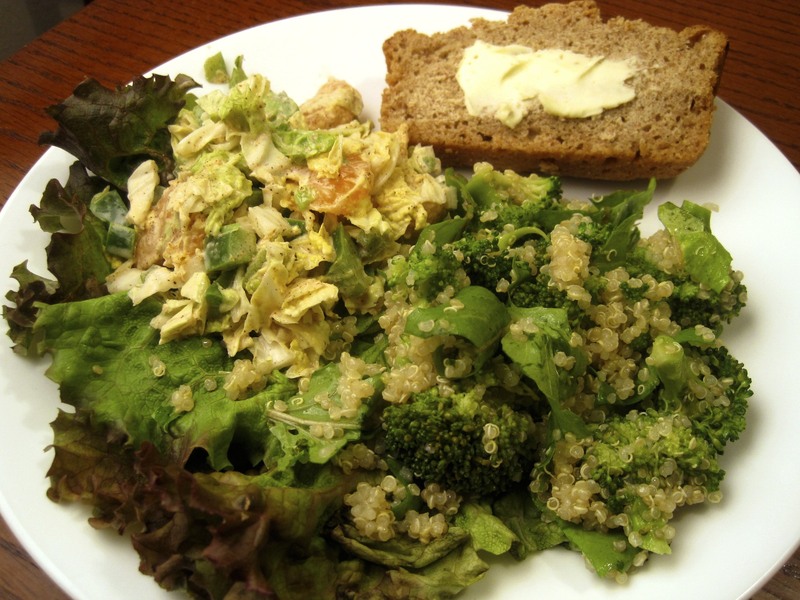 Give your family a green challenge this week and try to include leafy vegetables in as many meals as you can. Your taste buds– and your local farmers– will thank you! Like most Austinites who’ve been here longer than a few years, I have become somewhat of a connoisseur of Tex-Mex cuisine. I love comparing notes with fellow foodies about which restaurant’s margaritas, salsas, and enchiladas are the best in town, and although we rarely agree, it’s a nice way to build up a good appetite. There are several excellent bloggers who write extensively about Tex-Mex home cooking; my favorites are superstars Lisa Fain of Homesick Texan and Elise Bauer of Simply Recipes. Though neither writer is based in Texas, their recipes demonstrate that staples like tacos, enchiladas, and burritos lend themselves beautifully to the peppers, greens and tomatoes that grow nearly year-round in Austin. As I’ve experimented with their recipes and others, I have learned that most Tex-Mex food is easy to prepare with everyday ingredients and tools in your kitchen. Take for example this vegan enchilada sauce. If you can use a knife, a stove, and blender, you’ve got what it takes to make killer Tex-Mex. 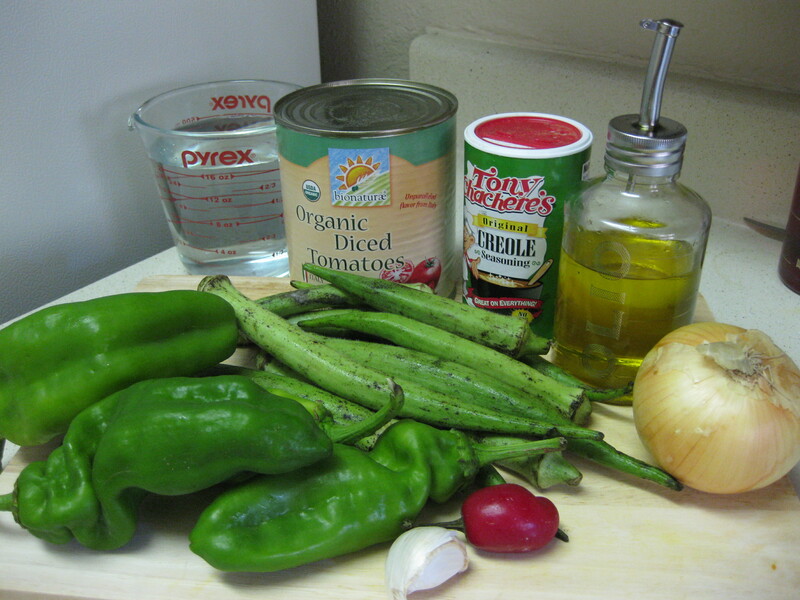 Whatever you decide to do with it, I hope you enjoy this simple, healthy enchilada sauce! To prepare sauce: dice onion and peppers. Peel and mince garlic. In a large sauce pan, cook onions, peppers, and garlic in olive oil over medium-low heat until they are very mushy, about 15 minutes. Increase heat to medium and add tomatoes, vegetable broth, chili powder, salt, and cumin. Stir to combine. Cook sauce, covered, for 15 minutes to develop the flavors. Remove sauce from heat and allow to cool before processing it in a blender until smooth. 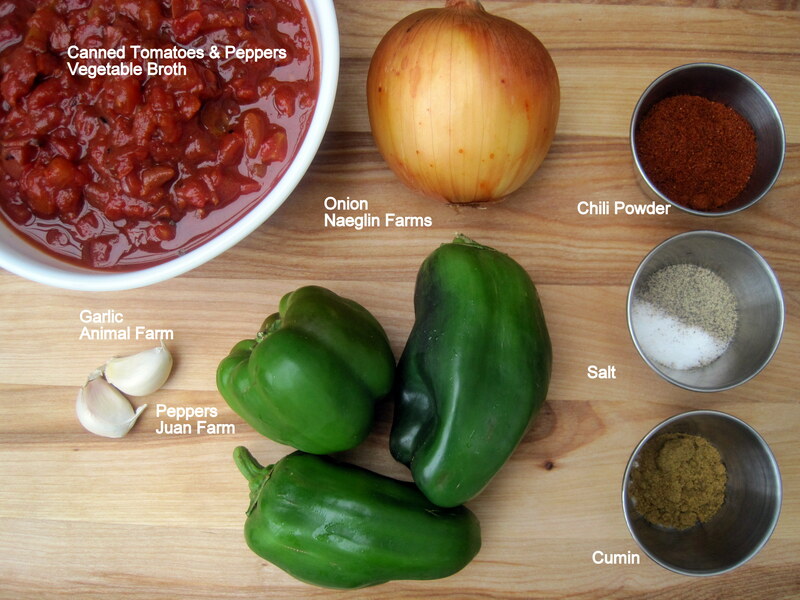 Store finished sauce in an airtight container in the fridge for up to five days, or in the freezer for up to a month. I hate punch. Well, I hate most non-alcoholic punch. It’s usually too sweet for me, and filled with weird artificial colors and sweeteners. A good sangria I’ll take any day, but that wasn’t really an option for a baby shower. So, when I was planning my sister’s recent baby shower I set out to make a not-too-sweet, not-artificially-colored, pink punch that would please my picky palate. 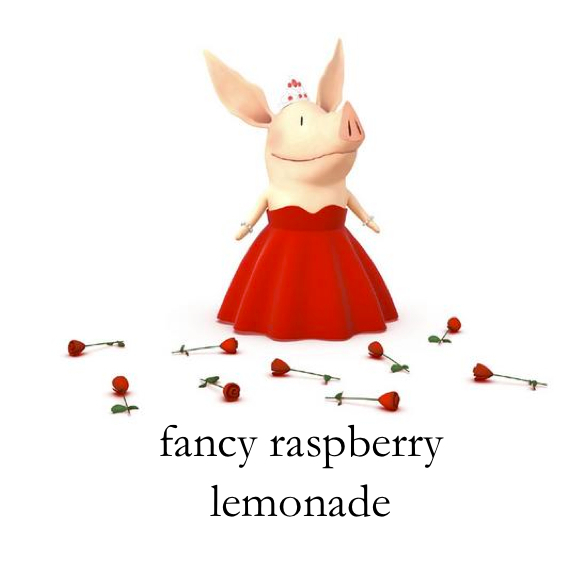 I think I found it in this easy raspberry lemonade, sweetened with cane sugar and pink-ified with raspberry puree. I wish I could tell you that I made the lemonade part of this with locally grown, meyer lemons lovingly hand-squeezed by yours truly. But I can’t. I was too busy to squeeze enough lemon juice to make this punch from scratch so I turned to Cascadian Farms’ Organic Frozen Lemonade from concentrate. The frozen concentrate was a real time saver, and at least the lemon garnishes on the punch glasses were made with locally grown lemons. If you’ve read my blog the past few days, you’ll know that this baby shower was book-themed. The deep pink of the raspberries reminded me of one of my favorite literary characters: Olivia the pig. Olivia’s Opposites is a great board book that introduces little ones to Olivia and, as the title suggests, the concept of opposites. Hot, cold. Big, small. Plain, and fancy. Of course, this raspberry lemonade looks plenty fancy in a pitcher garnished with fresh raspberry ice cubes and meyer lemon wedges. We played up the idea of opposites by putting “plain” tap water in a pitcher next to the “fancy” punch. 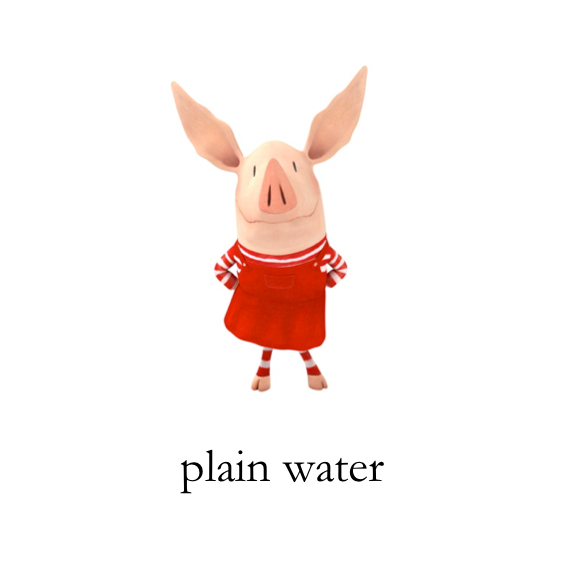 Here are the menu cards I designed to accompany the pitchers, borrowing Ian Falconer’s wonderful illustrations of Olivia. A day ahead of service, prepare the garnishes: place one fresh raspberry in each well of an ice-cube tray. Fill tray with water and freeze until ice cubes are solid. Repeat until all the fresh raspberries are encased in fancy ice cubes. (Frozen berries will work for this, but I had a hard time breaking them into single berries. Fresh berries were faster and prettier in the end.) Slice fresh lemon into wedges for garnish. Use a paring knife to score the membrane between the lemon segments so that they balance easily on the edge of the punch cups. To make the punch: Empty the bag of frozen raspberries into a small bowl and cover with 1/2 cup granulated sugar. Allow berries to sit at room temperature for half an hour or so. Puree macerated berries in a blender or food processor until completely liquefied. Strain raspberry puree through a sieve to remove any seeds, then set aside. Combine sparkling water and lemonade concentrate in a large punch bowl or two 76 oz. pitchers, with the ratio of one can lemonade to one liter sparkling water. Stir very slowly; the water will bubble up a lot when it hits the lemonade. 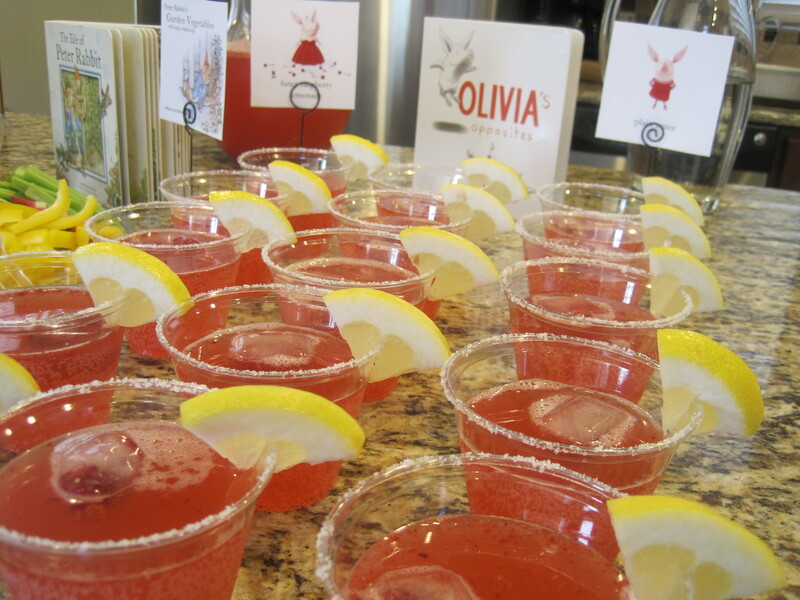 Once bubbling has subsided, add raspberry puree to lemonade and stir to combine. Garnish fancy cups: Rim punch cups with sugar by rubbing a lemon wedge along the top edge of each cup and dipping edge in a shallow bowl of granulated sugar. Garnish each cup with a lemon wedge. Place a few raspberry ice cubes in each cup and add pretty pink punch. Voila! Olivia would be proud! How do you fix a broken tomato? Tomato paste! What’s spicy, green and red all over? 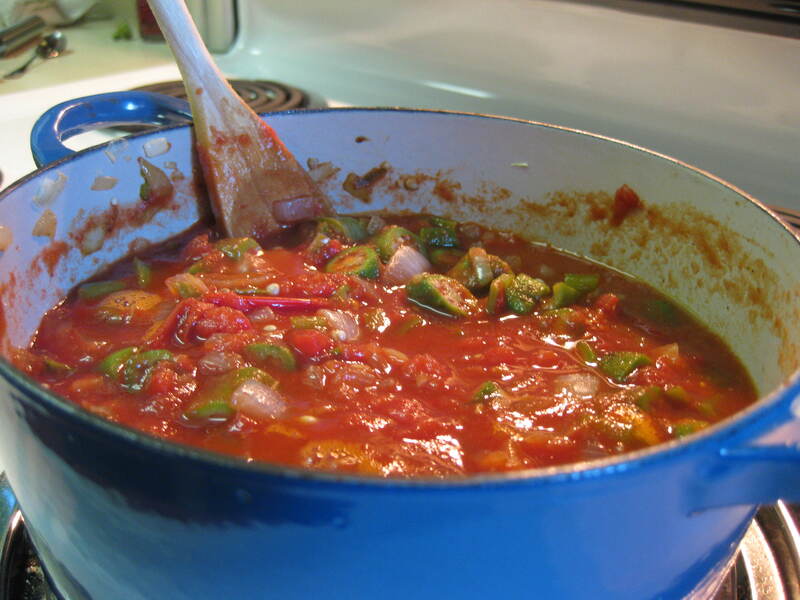 A blog post with pictures of stewed okra, tomatoes and peppers on it! Knock knock. Who’s there? Okra. Okra who? Okra Winfrey’s coming over for dinner!! Ok, seriously. This is one of my favorite summer recipes. It uses delicious, healthy ingredients and requires almost zero skill to prepare, plus it’s vegan! Heat olive oil on medium high heat in a large pot. Chop onion, peppers, jalapeño, garlic, and okra, adding the chopped veggies to the pot as you go. Saute vegetable mixture on medium high heat for 10 minutes, stirring occasionally. The onions, peppers, garlic and okra should start to caramelize, turning dark brown at the edges. The okra will give off lots of slime. Meanwhile, chop the tomatoes or open the 12 oz. can of tomatoes and add those to the pot, with liquid. Season mixture with Cajun seasoning of your choice. Turn heat down to low. Cover and simmer for fifteen minutes to an hour. If you simmer it for the full hour, most of the okra will be pretty broken down and the slimy texture will be gone. Serve this on its own or over rice, grits or polenta. *In closing: What do you call a nosy pepper? Jalapeno business! !